Planned Parenthood Gets Win At Supreme Court Over Effort To Defund Two states had tried to block the use of Medicaid money for non-abortion, pregnancy-related health care services at Planned Parenthood. The action is a big win for Planned Parenthood. 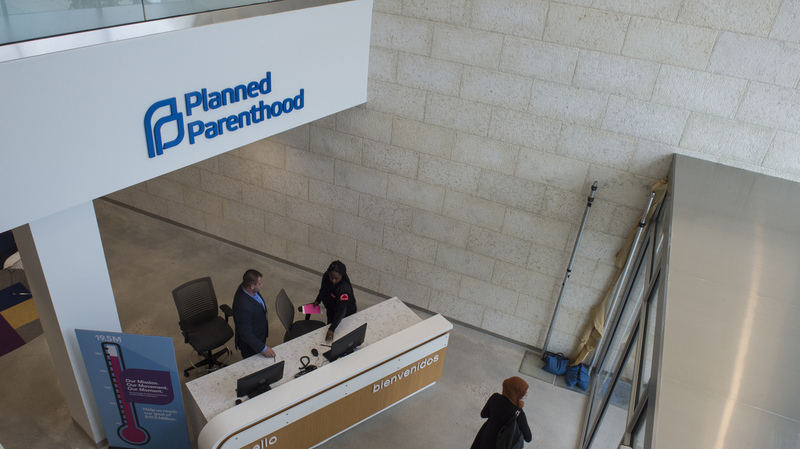 Planned Parenthood opened its new headquarters in Washington, D.C., in September. The Supreme Court declined to take up a key case, a big win for the organization. The case does not involve federal money for abortion-related services. That is barred by federal law. Rather, it involves an effort by two states to block Medicaid funding for some abortion providers that, like Planned Parenthood, get Medicaid funding for providing other services to low-income women, services like cancer screenings, prenatal services, birth control and ultrasounds. Three conservative justices — Clarence Thomas, Neil Gorsuch and Samuel Alito — dissented and would have heard the challenges brought by Kansas and Louisiana. But notably, two other conservatives, Chief Justice John Roberts and Justice Brett Kavanaugh, did not. They were joined by the court's four liberals. The court's decision not to decide strongly suggests that a majority of justices, led by Roberts, would like to keep a low profile this term. In the aftermath of the explosive and divisive Kavanaugh confirmation hearings this fall, and with two new justices on the court in less than a year, Roberts and most of the other justices have gone out of their way to paint the court as a nonpartisan, apolitical institution. "It's an incredibly important thing for the court to guard — is this reputation of being fair, of being impartial, of being neutral, and not being simply an extension of the terribly polarized political process and environment that we live in," Justice Elena Kagan said in October. And last month, Chief Justice Roberts issued an extraordinary rebuke of President Trump for angry remarks that dismissed a lower court decision by an "Obama Judge" as a "disgrace." Roberts then issued a statement declaring, "We do not have Obama judges or Trump judges, Bush judges or Clinton judges. What we have is an extraordinary group of dedicated judges doing their level best to do equal right to those appearing before them. That independent judiciary is something we should all be thankful for." The justices' decision to stay out of the Medicaid issue goes back to discredited videos purporting to show Planned Parenthood officials inappropriately looking to sell fetal parts. Despite evidence showing the videos had been edited, some states then enacted laws that removed Planned Parenthood from their list of qualified Medicaid providers for other women's health services. Planned Parenthood, which says that only 3 percent of the services it provides are abortions, then sued, along with other similarly affected organizations. "[T]his 3 percent statistic has many critics, who point out, for example, that it doesn't explain how much of Planned Parenthood's revenue comes from abortion. Others note that the figure counts services provided, not patients served — and some patients receive more than one service from the organization. That means more than 3 percent of patients receive abortions (PolitiFact [that] week estimated the figure at around 12 percent, for example)." Planned Parenthood contended in this case the states were singling them out for disfavored treatment because they separately provide constitutionally protected abortion services. The court's decision Monday to stay out of the issue for now leaves in place a conflict in lower court decisions. It lets stand decisions in five federal appeals courts that have ruled in favor of Planned Parenthood and other women's health service providers, and one appeals court that has ruled the other way. Six remaining circuits — most of them in geographical areas dominated by Democrats — have not ruled on the issue; presumably most, if not all of, the states in those circuits have not enacted a ban on Medicaid funding for women's health service providers if those organizations also provide separate and privately funded abortion services. Some 70 million Americans are on Medicaid, Justice Thomas observed in his dissent. The court, he said, should have heard the case and resolved the legal conflict. "So what explains the court's refusal to do its job here?" Thomas asked in the written dissent joined by Gorsuch and Alito. "I suspect that some" of those health service providers challenging their removal "are named Planned Parenthood." But, he added, "some tenuous connection to a politically fraught issue does not justify abdicating our judicial duty." "We are pleased that lower court rulings protecting patients remain in place. Every person has a fundamental right to health care, no matter who they are, where they live, or how much they earn. As a doctor, I have seen what's at stake when people cannot access the care they need, and when politics gets in the way of people making their own health care choices. We won't stop fighting for every patient who relies on Planned Parenthood for life-saving, life-changing care." "Taxation without representation lives on today in a decision by a majority on the court that ignores the wishes of state leaders who no longer want to be coerced into funding abortion. Abortion is not healthcare, and women's needs are better met by real, full-service medical locations, not abortion vendors. This is a legitimate question and a missed opportunity — whether abortion vendors have a right to taxpayer monies."